Roger Federer of Switzerland hits a forehand in his match against Grigor Dimitrov of Bulgaria on his way to winning his 300th Grand Slam match Friday at the Australian Open in Melbourne. More than 16 years after Roger Federer played in his first Grand Slam event, he's won his 300th match, becoming the first man to reach that mark. He now trails only Martina Navratilova, who won 306 matches at the highest level of tennis. Federer, 34, is currently ranked No. 3 in the world. "It's very exciting, I must tell you. Like when I reached 1,000 [career match wins] last year, it was a big deal for me," Federer said after his four-set win over world No. 28 Grigor Dimitrov at the Australian Open on Friday. "Not something I ever aimed for or looked for, but when it happens, it's very special." The 300-win mark is yet another milestone in Federer's career. Two other records he holds show that he put those wins to good use: 17 Grand Slam tournaments won and 27 finals reached. Federer is one of seven male players who have won all four Grand Slam events. Those 300 wins include two record stretches in which Federer was unbeatable — whether in majors or other tournaments. In one span from 2003-2008, he won 65 times in a row on grass; in another from 2005-2006, he won 56 straight matches on hardcourts. 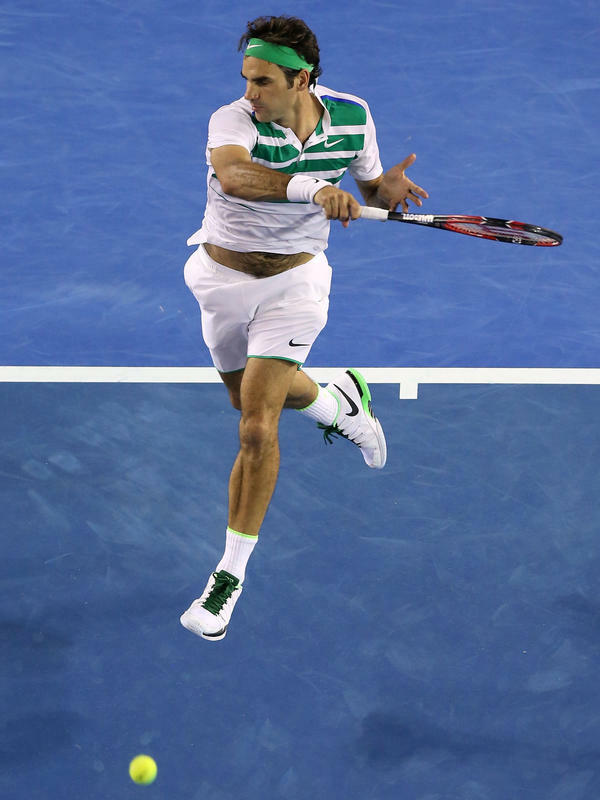 Federer is now the oldest man to reach the Australian Open's fourth round since Andre Agassi did it in 2005. And today's win led him to look back on the early days of his career — including the need to make mistakes. "I wish I could have maybe been tougher when I was younger in practice, but I guess that's just how it needed to be. It needed to be genius or horrible," he said, according to the tournament's website. "I needed to have that wide spectrum. I needed to make mistakes to become the player I am today. In a way I would do it again the same way, with just some minor adjustments along the way."